Fblog: You are a documentary photographer. What that means to you - to make documentary? Do you have any "credo"? 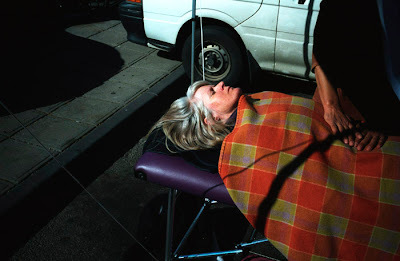 Jesse Marlow: Documentary photography is what has always interested me. My interest in documenting things began when I was 8 years old and my uncle gave me a book about New York Subway graffiti. This led to me borrowing my Mum’s SLR and walking around the streets with my brother looking for the brightly coloured graffiti murals that began appearing around Melbourne in the mid 1980’s. Since being a working photographer, the smaller unique stories are what I have sought. 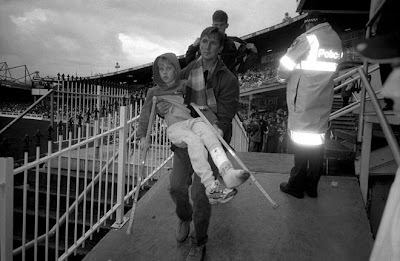 My project The Wounded was more of a conceptual documentary project, The Wounded series was shot as a result of finding myself with a broken arm and seeing so many others around me in similar situations. Fblog: The "conceptual documentary project" - strange hybrid. What does it mean to you? Does it have anything to do with documentary in conceptual arts in 70-80? Anyway, I see many conceptual ideas flourishing now in photography. Jesse Marlow: No, nothing to do with conceptual arts from the 70's - 80's... The Wounded project was a documentary project shot on the street. I shot the whole series with a book in mind. The subject matter, approach to shooting and style I used was more conceptual then the other bodies of work I have undertaken. Fblog: Documenting graffiti has led you to an idea of documenting a moments of daily life in the streets. But is there anything specific that derives streetphotography from all other pics made in the streets? 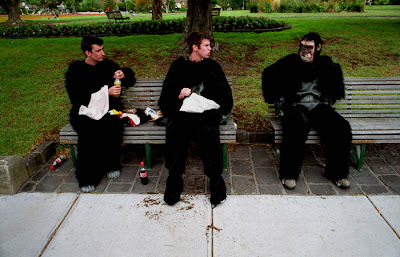 Jesse Marlow: Street photographers never switch off. 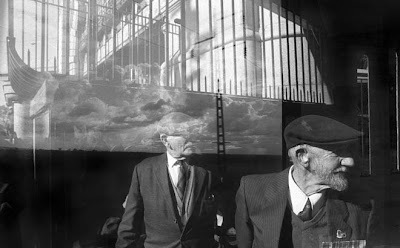 The work of photographers Matt Stuart, Blake Andrews, Nils Jorgensen and others from in-public.com are great examples of how the street photographer never stops looking and shooting. 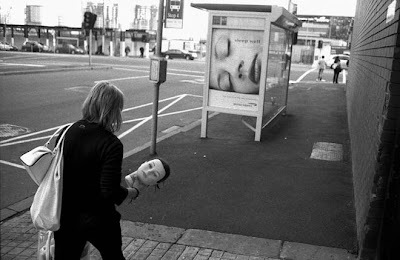 The street photographer is constantly on the lookout out for the unreal moment in the everyday. Fblog: Tell me more about your web-activities, like Oculi and in.public. These are very interesting and "brainstorming" websites about photography. Jesse Marlow: I’ve been a member of in.public and Oculi for a number of years. Both collectives were the creations of a small group of like-minded photographers getting together and showcasing their work in a collective online environment. In.public has is it’s own private discussion board for members only. This has been such a wonderful sounding board for many of the photographers to post new work and have it instantly critiqued by other members in the group. Fblog: Nice to hear and it sounds familiar to me. It is exactely what Fblog stands for. What about in.public, a site with great photographers. How did you meet and do you work together sometimes? Jesse Marlow: in.public was formed in 2000 by 3 London photographers who discovered each others work and led by Nick Turpin decided to form an online gallery showcasing their street images. I joined in 2001 and now there are 18 members. The bulk of the group are from London and New York and there are 3 members including myself from Australia. We are all friends through our private online discussion board and members are often catching up with each other for dinner or to go out shooting if they find themselves in London or New York where the majority of the members live. As a group we have worked on a couple of small group projects over the years including some magazine publications, small projects and group exhibitions. Fblog: You're making pictures both in black&white and in colour. Which one do you prefer? Jesse Marlow: I haven’t shot black and white for a few years now. After finishing my Wounded project which was shot in the winter months in Melbourne and in Europe. I was eager to try something new. I was looking at things differently. All of a sudden shape and colour was what I was seeing. All of my work since 2005 has been in colour. Fblog: Ok, lets concentrate on technical aspects for a second... digital, chromes or c41? Any experiments with color: cross-processed, pull/push process? 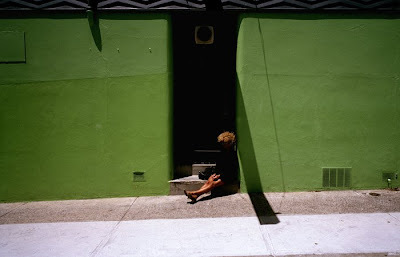 Jesse Marlow: I shoot all of my work on film still. C41, Fuji 400 ISO, normal processing. I have a scanner and then print the images. Fblog: And what about “technics” in the street? What do you do to make a pic? Do you sneak around, study the geometry and composition first or it's just of being there in time and things just happen? Jesse Marlow: When I am on the streets working I don't have any preconceived ideas about what I am looking for. Also, I don't say to myself "I am going to go out into the city and take photos for the afternoon". When I do this I always come home with no photos because I have forced it. My photos from Don't just tell them, show them are taken in my daily travels. I find this a much more natural way of shooting then dedicating a block of time to taking photos on the street. When I am out and about something will catch my eye, a scene, a juxtaposition, a coloured wall.. Whatever catches my eye triggers me to stop, analyse what is before me and wait for the right moment. There was a lot of hours spent walking the busy streets for the Wounded series but the new work is more about the banality of everyday, set in an urban environment. Fblog: I would like to ask for more details on Don't just tell them, show them. Please explain what's it all about? I think that some of these pictures are the most significant in your work up to date. They are remarkable, showing your style, genuine one. 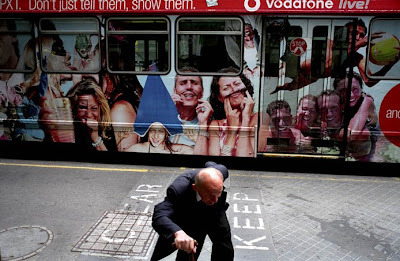 Jesse Marlow: Don’t just tell them, show them is my on-going series of street photos. The images are taken in my daily travels. Stylistically the project is very different to my last project Wounded which was very structured. My shooting style is a lot looser and the series explores the banality of everyday existence set in the environment of the street. 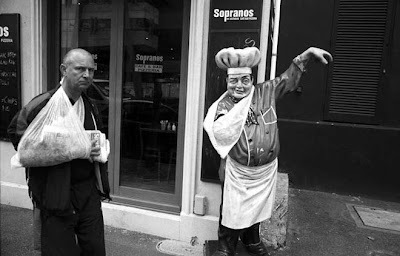 Fblog: Yes, the banality of daily life… And you show it with respect to the people you photograph. How important is this to you while taking pictures? Have you ever decided not to shoot, when you've seen an action happening in front of you? Jesse Marlow: Of course, there have been several times when I have wanted to shoot but haven't so instead I have taken mental photos. I think it's just as important to know when not to shoot when out on the stret. Fblog: What gives you the inspiration to work? Is there any photographer who made a great influence on your work? Jesse Marlow: When I was younger and starting out I was inspired by many of the Magnum photographers. Their ability to take great photos in any environment is what inspired me the most. Photographers: Joel Meyerowitz, Gary Winogrand and Josef Koudelka have been the most influential photographers for my development as a photographer. Over the last 8 years, there have been so many other photographers and artists that have inspired me. Lately, I have been drawing inspiration from the work of an Australian painter named Jeffery Smart. Fblog: Thank you very much for this e-chat and for revealing some details about your work. We’re honoured to show your pictures in the Fblog. Thank you!